A group of men from our Church went to Guatemala on a missions trip to do some constructionesque type work at an orphanage near Guatemala City. This morning the recently returned group took turns recounting details of their trip to our congregation. My father was among those men. Almost every man who spoke mentioned a trip to the city landfill. On their one day sightseeing, a stop at the dump had been placed on their itinerary. Why in the world? Weren’t all landfills the same, full of people’s garbage? This landfill was unlike anything the men had ever seen. 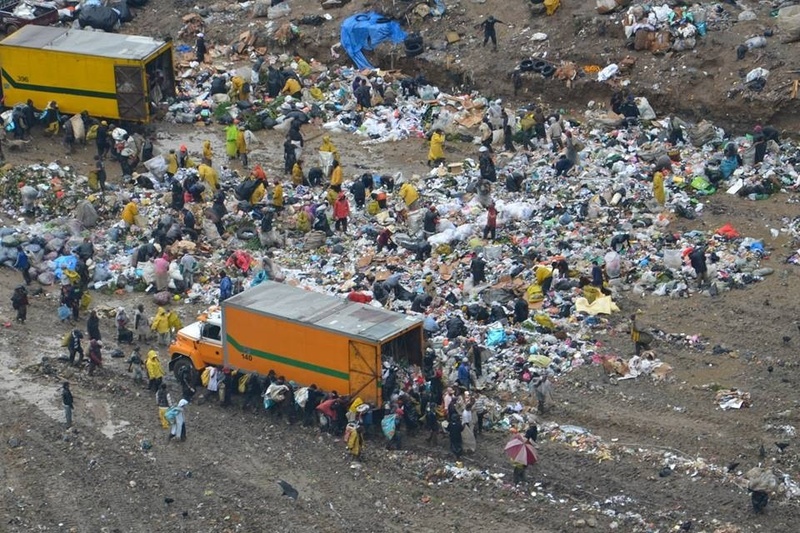 Hundreds, if not thousands, of people living in tents that dotted the landfill, pilfering through the heaps of trash, swarming the garbage trucks as their contents dumped upon the mounds of debris. Men, women, and children, many of whom were some of the over 350,000 orphans living in Guatemala. All the men who spoke talked about their perspectives having been forever changed after having witnessed the goings on at the Guatemalan dump. Watching men their age not being able to provide for their families, watching children wander aimlessly with hopeless brown eyes staring back at them, or watching a mother and son wait to eat the scraps of food left over from their noon meal. Their perspectives had changed. What’s my perspective? I gripe because I am bombarded with food every where I turn. A fat girl trying to drop some weight so she fits in the new fall line at Ann Taylor this season. I gripe because life’s not fair, some people eating cheeseburgers and French fries all day while I have to settle for grilled chicken and a tossed salad with just the slightest drop of balsamic vinaigrette. I gripe because instead of worrying about where my next meal will come from I’m fighting the urge to stop by Baskin Robbins for a banana split. I’d love to tell you about how my husband begged me to make a pan of cornbread today and I enjoyed one slice sans butter, how I got in plenty of cardio this weekend even though it was hot as blue blazes, and how last night I tried a new recipe with Ancho Chiles, an ingredient that made me feel like one of the cheftestants on Chopped. But you see, after seeing the pictures of those men working surrounded by razor wire and guards armed with AK-47s, being told stories of literal vultures stealing food from children scouring the dump for what we wouldn’t feed a dog, and hearing the heartbreak in my father’s voice as he describe unimaginable poverty, it just doesn’t seem important. At least not today. My perspective has changed. You are such an inspiration to me!!! Thank you for doing this blog!!! This entry really hit home with me today!! We are so blessed and we take so much for granted!! But today I to will have a different perspective! !